The information for this article came from the Jet Propulsion Laboratory website at http://www.jpl.nasa.gov. Photo courtesy of NASA/JPL-Caltech. On page 3 is an artist's depiction of the climactic moment for the Deep Impact space probe. This spacecraft is expected to launch on January 12 and will rendezvous with Comet Tempel 1. Well, maybe rendezvous isn't quite right. The spacecraft will be runover by the comet at a speed of about 23,000 miles per hour. If all goes according to the schedule the fireworks are set for July 4. The portion of the spacecraft that gets clobbered is the Impactor. A larger piece is called the Flyby. And what does it do? "We will be capturing the whole thing on the most powerful camera to fly in deep space," according to Dr. Michael A'Hearn, Deep Impact's principal investigator. "We know so little about the structure of cometary nuclei that we need exceptional equipment to ensure that we capture the event, whatever the details of the impact turn out to be." And there will be other cameras trained on the event as well. Chandra, Hubble and Spitzer will also be looking on. All of this television coverage may make you think about the impact of the impact. I mean, won't this alter the Tempel 1's orbit. 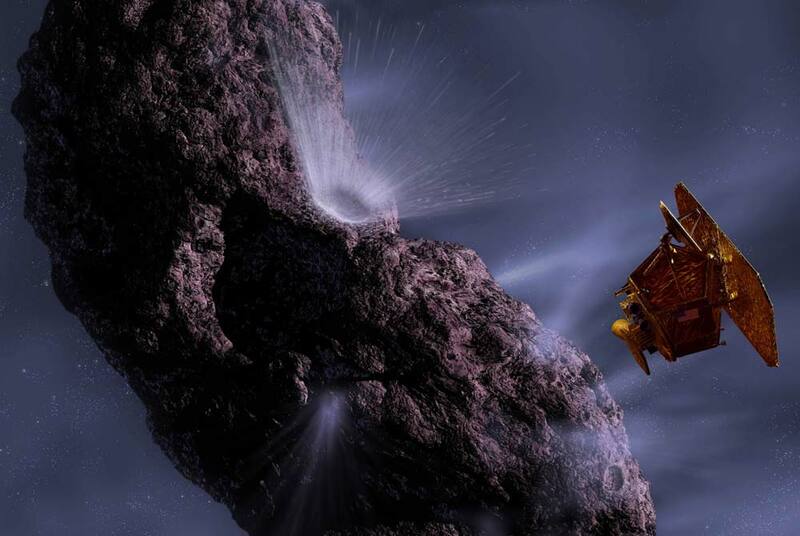 "In the world of science, this is the astronomical equivalent of a 767 airliner running into a mosquito," said Don Yeomans, a Deep Impact mission scientist at JPL. "It simply will not appreciably modify the comet's orbital path." This episode of CSI:Comet is brought to you by the Discovery program of NASA - a series of moderately priced solar system exploration missions. And the time cycle is pretty cool. According to Rick Grammier, Deep Impact project manager at NASA's Jet Propulsion Laboratory, "From central Florida to the surface of a comet in six months is almost instant gratification from a deep space mission viewpoint."